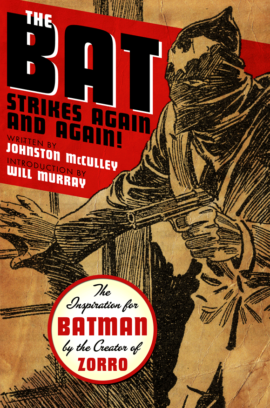 One of the strangest pulp heroes is finally available from Altus Press! 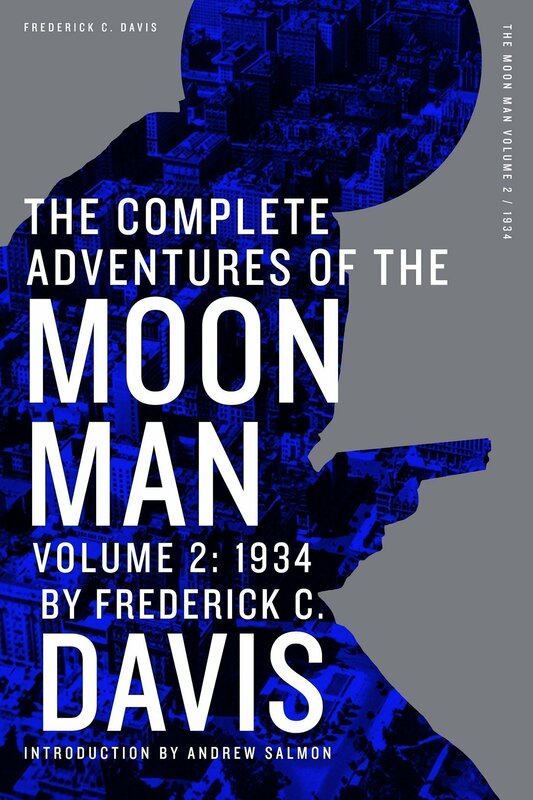 Created by pulp fiction legend Frederick C. Davis for the pages of the ultra-rare title, Ten Detective Aces, the Moon Man fought the forces of the underworld in 38 unforgettable tales. 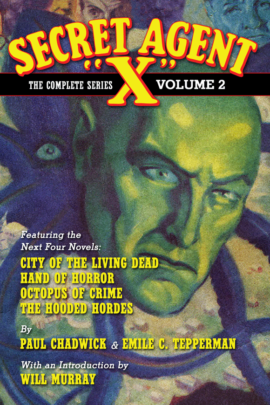 Volume 2 collects the next six stories from this series: “Silver Death,” “Mark of the Moon Man,” “Crimson Shackles,” “Blood Bargain,” “The Black Lash” and “The Murder Master.” And it includes an all-new introduction by Moon Man expert Andrew Salmon. Mark of the Moon Man: The notorious Moon Man was dead—officially. He had faked his death to save his father—the police chief—and the father of his girl from the disgrace of dishonorable discharge. But now the Moon Man had to come back. Some tremendous power was forcing him to forget the chief, forget Lieutenant McEwen, and forget the girl he loved. 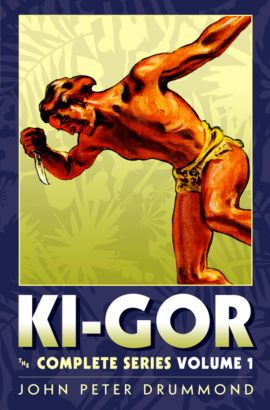 Some power was compelling him to play the role of the lowest of two-legged rats. And the first step of that path was marked by a dying man whose jaws were locked on a horrible secret. Crimson Shackles: Detective Sergeant Steve Thatcher was captured by a masked band. And Steve Thatcher’s buried secret was ruthlessly dragged from its shallow grave. For Steve Thatcher was the Moon Man—the notorious criminal who robbed the rich. Secundus, leader of the masked Red Five, fettered the Moon Man with sinister shackles. And to forever seal those shackles, Secundus brought a surprise to the Moon Man. That surprise enmeshed the Moon Man in a web from which there was no escape. 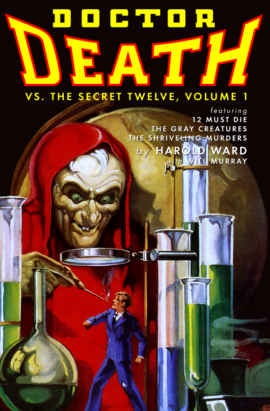 Blood Bargain: The Moon Man was on a double spot. He not only faced disastrous exposure—but was forced to watch his sweetheart steal like a common thief. He watched Sue McEwen, daughter of a police lieutenant, take active part in an amazing robbery. But the Moon Man could do nothing. For he had been forced to lead that raid. And Secundus, master of the infamous Red Four, tightened his grip on the Moon Man. The Black Lash: A miasma of mystery oozed from the tarmac of Great City’s airport. The Secretary of the Chamber of Commerce had chartered a plane. He was a feverishly impatient man, and his face had a strange look—as if he were grinning at an open grave. When that plane went up, the lid blew off Great City. A maelstrom of murder engulfed Detective McEwen. And that most famous of the infamous, the Moon Man, flung the gauntlet of defiance at the dread Crimson Trio. The Murder Master: Sue McEwen’s gun killed a man. Her own father, Lieutenant McEwen, arrested her—for murder. Then he moved heaven and earth to prove her innocence. But he was helpless against the cleverness of the murderer. Even the man she loved, Detective Sergeant Steve Thatcher, was powerless to help her. But the Moon Man—that famous of infamous prowlers—championed her cause against the Murder Master.